Monday (16/4), Faculty of Economics and Business Universitas Brawijaya holds routine agenda of Kuliah Bakti Alumni where FEB UB alumni who have been successful in work world return to their alma mater to give guest lecture to share knowledge, experience and motivation to students of Faculty of Economics and Business Universitas Brawijaya to prepare themselves in the competition in the world of work that will be faced later. The event which was held in F Building Hall F FEB UB was attended by the Dean of FEB UB, Vice Dean I FEB UB, Vice Dean II FEB UB, Head of Administration FEB UB, and Lecturer and Student FEB UB. Alumni Bakti lecture this time presents the speaker R. P Jusuf Indarto, one of the alumni of the Department of Economics FEB UB who is the former Head of DJBC Regional Office of East Kalimantan, and Rizky Aditya Putra, one of the alumni of FEB UB Management Department, who is the young CEO of CV. Putra Mahodenk Kotawaringin and Founder of Yayasan Islam EKTP. Exactly at 10.00 am, the activity of Kuliah Bakti Alumni was opened by a speech from the Dean of the Faculty of Economics and Business, Nurkholis, SE., M.Bus. (Acc)., Ak., Ph.D. In his speech, he conveyed that Kuliah Bakti Alumni is more about science and cases that occur in the field, so it is expected to be a provision for FEB UB students in facing challenges in the real world of work in addition to the provision of the sciences that have been obtained on the bench lectures. 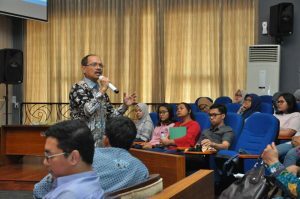 The material session was guided by the Chairman of UB’s Alumni Association, Mardiwibawa, SE., MM. In the first session of the presenters filled by R. P Jusuf Indarto or who is familiarly called Mr. Yosi, said that at this time, with the development of extraordinary technology and accurate information that is easily obtained, making the work world competition higher along with the high requirements set by the company. In the delivery of Mr. Yosi said that, in every company needs a leader who can protect his subordinates. A good leader is a leader who is able to instill a concept in his subordinates that work is worship, so that employees have a strong and unaffected character to satisfy personal interests. In addition, leaders must also be able to be role models, able to give moral boost for subordinates, and able to coordinate with external parties with a positive meaning. In closing, Mr. Yosi explained the important points that can be done by students in preparing themselves for the world of work, among other things: Out of the comfort zone, keep learning, be smart and creative, always grateful, be useful for others, and confident because if we do not have a strong stance then we will easily fall into the cases that we never do. Mr. Yosi expressed his hope for UB FEB students to always be critical, respect the rights of others and believe that the young generation is the leader of the future and always put forward the conscience. In addition, Mr. Yosi emphasized that when serving in a position, we must know the main duties, functions, authority, responsibility and legal basis in carrying out the work, and the start and end date of a position. Do not feel better than others, always ask for feedback from others, humbly and develop good interpersonal. The second session of the presenters continued with the delivery of material by Rizky Aditya Putra. 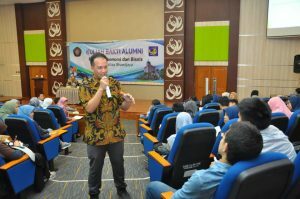 Rizky graduated from the Department of Management FEB UB in 2010. The interesting thing about Rizky figure is that he managed to become one of the best graduates and got the opportunity to graduate from Faculty of Economics and Business Universitas Brawijaya without thesis. Though he said the academic value he belongs to the low category. But Rizky was able to prove that although he was not bright in the academic field, he was brilliant in the business development on the field, as evidenced by the successful business competition he won while still a student at FEB UB. Rizky said that “Success is not the best problem, but success is how we are able to do good and useful”. A good businessman not only views business theories, but also has to be able to mix with other entrepreneurs, full of curiosity and never tired to learn from other entrepreneurs. Do not waste your youth with useless things. Rizky says that when we do not have good soft skills and hard skills we will not be anything. 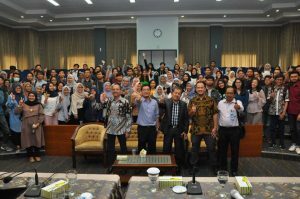 This activity of Alumni Bakti Lecture received high enthusiasm from the students of Faculty of Economics and Business, this is evident from the many questions asked to the two speakers. Furthermore, this activity is closed with a photo session along with the two speakers.